On Thursday evening following the musical presentation, the authors (and Development Office staff) were invited to Steve Alter’s home at Oakville for dinner. Rather than a typical menu, there were cooks producing common Indian snacks, all set up outside on the veranda. Besides those shown below, there were chicken wings and a few other things. 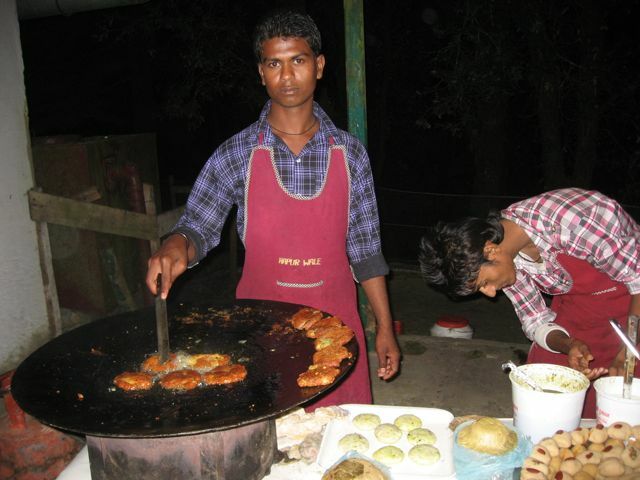 Aloo Tikkis are a savory potato patty, fried on a large griddle. A serving includes a variety of toppings, usually including yogurt, tamarind sauce, and coriander sauce. Years ago, this was Dan's favorite snack (if I dare say that, samosas rank pretty high, too). There was a vendor right outside the Rialto movie theater where he usually got them. 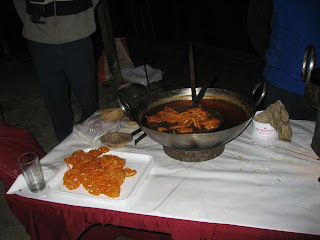 Jalebis are too sweet for some people. The dough is drizzled into hot oil, in squiggly shapes. As soon as they are cooked, they are dropped into sugar syrup. As the squiggle is quite hollow, it fills with syrupy sweetness. When fresh and still warm, they are delicious. 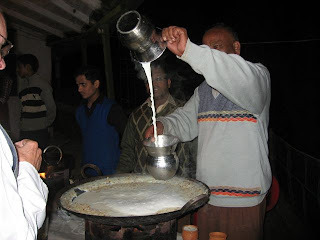 Serving them with dahi (fresh yogurt), cuts the sweetness and increases the nutrition. Sweetened steamed milk topped with ground almonds was poured between pitchers to get it good and foamy, then served in clay cups. These used to be common at railway stations -- they are biodegradable and could just be tossed out the window without permanent littering. Sadly, tea shops at the train stations now serve tea in a little plastic cup -- with a teabag! Toby Sinclair is an Englishman who has lived in India since 1977. The title of his talk was “Goddess in Despair,” referring to the Ganga (Indian word for Ganges). He was the producer of the film “Ganges” that was shown near the beginning of the Festival. He talked more about the river and some of the ravages it has suffered. In the 1960s the US planted a plutonium-powered nuclear spying device in the Nanda Devi sanctuary. It hasn’t been seen or tracked since 1968. Did it disappear into one of the Ganga tributaries? The Tehri Dam, in planning since 1972, opened in 2006, creating some areas of a nearly dry river below. The river’s greatest gift is its silt, which fertilizes one of the largest fertile areas in the world. Bernadette McDonald, the biographer who spoke about three of her subjects earlier, talked about “Freedom Climbers.” It is about the golden age of Polish climbers, 1975-95. She told us about one particular climb two men did up a face in a heavy storm, when they ran out of food and fuel. The mysterious “third man” was with them as a sometimes malevolent, but mainly benevolent, force. A few quotes: “We were ready to die, but not ready to give up.” “You can’t attain enlightenment on a full stomach.” When they finally rappelled down, the third man was there helping them.